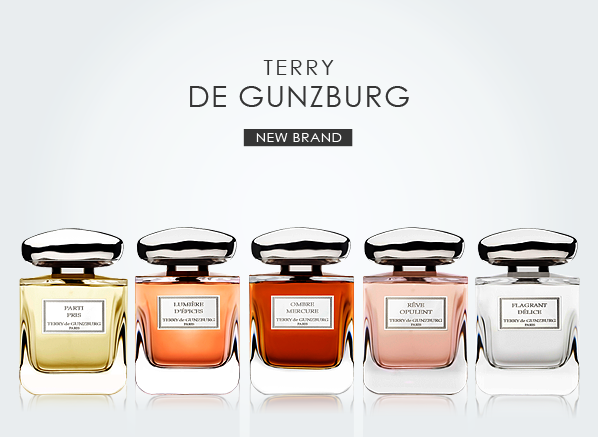 Today I have news of a very exciting launch at Escentual HQ: the brand new fragrance range from cosmetics icon Terry de Gunzburg. Terry’s beauty credentials are impressive. Among her many achievements as former creative director of YSL Beauté, she masterminded a fusion of concealer and highlighter and proclaimed the result ‘Touche Eclat’ (perhaps you’ve heard of it?). Upon leaving YSL, she created her very own make-up line, By Terry, founded upon the concept of luxurious, couture make-up. And for her latest venture? Well, she’s taking on the world of haute parfumerie. Ombre Mercure is definitely the most outwardly seductive fragrance of Terry’s new collection. It is an intense scent structured around the noble beauty of the iris, and formulated with pure iris butter. Though complemented with rose, powder-like violet, ylang-ylang and jasmine in the heart notes, it is patchouli that is the iris’ most prominent partner. The scent takes on a surprising sweetness when accented by vanilla and benzoin in the base notes. An Escentual staff favourite, Ombre Mercure is a majectic and powerful fragrance that, when worn, reveals intriguing contrasts: softness and darkness, femininity and intensity. It is an ideal fragrance for evening wear. This vibrant scent is built upon a most beautiful note trifecta: the zesty brightness of blood orange, the solar warmth of the Mediterranean jasmine flower and the languid sweetness of honey. Grapefruit and bergamot freshen the blood orange in the top notes for an explosive first impression, while woods and clove add depth to the dry down. I love the vibrancy of this blend, particularly the juicy blood orange note. It is exciting yet elegant, and has a touch of sultry sweetness that keeps you compulsively sniffing your wrist. If you like Elie Saab Le Parfum, you’ll love this. Now, here is a scent that smells entirely different to how I expected. The notes read like a vintage bouquet: tuberose, orange blossom, ylang-ylang and Turkish rose, and because of this I was anticipating something rich (and perhaps a little stuffy). What I actually got from Parti Pris was an effervescent bubbliness, bright and champagne-like, with a creamy twist of vanilla-tinged ylang-ylang. This lightness is anchored by smoked vetiver, sandalwood and Tolu balm in the dry down. Parti Pris is described as “the aura of chicness swathed in silk”, (a lovely, chocolately phrase), and I can definitely get on board with the silkiness. It’s a light and fluid floral scent that feels wonderful to wear. Reve Opulent is an unashamed gardenia scent with an underlying current of sweetness. Gardenia is a versatile bloom; in this composition, when paired with jasmine, rose and orange blossom, it is as fresh as cotton. Creamy ylang-ylang in the base is paired with Sri Lankan cinnamon for a hint of complementary warmth, which works so very well with the airiness of the heart. Reve Opulent is very much a dream-like scent. It’s floral and feminine, yet still incredibly interesting. A melange of traditional notes with a decidedly contemporary feel. This is very pretty. I had a hunch that I would favour this fragrance as I’m drawn to almond notes, and when I saw that Flagrant Delice also had fig, red currants and tonka beans added to the mix, I was sure I would love it. Despite the sweet and gourmand indication of almond and fruits, the scent is actually very sprightly. The combination of bitter green almond and sun-ripened fig in particular is bright and expansive, almost solar, and it stays this way right down to the musky base notes. I’m going to love wearing this fragrance in the summer as a foil to my usual out-and-out citruses. It’s sultry, laid-back and balanced. This entry was posted on Tuesday, February 26th, 2013 at 10:28 am and is filed under Fragrance, New products. You can follow any responses to this entry through the RSS 2.0 feed. You can skip to the end and leave a response. Pinging is currently not allowed.